The United States Congress designated the Mt. Moriah Wilderness (map) in 1989 and it now has a total of 79,974 acres. All of this wilderness is located in Nevada and is managed by the Bureau of Land Management and the Forest Service. Shallow caves, many of which show evidence of prehistoric habitation, are common in this Wilderness and it is suspected that many more have yet to be discovered. If you set out to explore this territory, you will be in the northern Snake Range of eastern Nevada, bounded on the east by Snake Valley and on the west by Spring Valley. 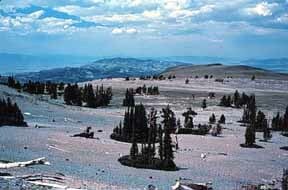 Stretching north and west of 12,050-foot Mount Moriah is a plateau known as The Table, a unique world of subalpine vegetation lined with bristlecone and limber pine. Mount Moriah rises as high as 6,000 feet above the surrounding Wilderness. Dry pinion-juniper forestland dominates a large part of the lower elevations here. About 30 miles of generally primitive trails provide access to the area from several primitive trailheads. Four year-round creeks provide watery homes for Bonneville cutthroat trout, but the heart of the area tends to be dry, requiring you to carry all your water. Rocky Mountain bighorn sheep scramble around Mount Moriah, but visitors are few (most come to hunt mule deer or grouse). The rugged topography is at least partially to blame. About 50 miles of fair to very poor trails give access to the area. Some trailheads on the east side are generally accessible by passenger car along roads that follow Hampton Creek, Hendry's Creek, and Smith Creek. Some of Mount Moriah Wilderness lies on BLM land and is managed by the Ely Field Office. Great Basin National Park lies just to the south. Planning to Visit the Mt. Moriah Wilderness? How to follow the seven standard Leave No Trace principles differs in different parts of the country (desert vs. Rocky Mountains). Click on any of the principles listed below to learn more about how they apply in the Mt. Moriah Wilderness.